ARLINGTON, Va. --- The mission of the Colorado Army National Guard's 100th Missile Defense Brigade is unique, but, for some brigade Soldiers, also fairly straightforward. "To me, it's very simple," said Army Maj. Jason Brewer, the chief of missile defense operations with the brigade. "If a rogue nation or other entity shoots an ICBM, inter-continental ballistic missile, at us, we intercept it." It's a mission the brigade -- the only unit of its type in the Army National Guard and one staffed with both active component and Army Guard Soldiers -- has been doing since 2003, when it was activated. It's also a mission that isn't quite as simple as it may sound. "You've got to think on your feet and you've got to look at things with a different lens," said Brewer. "In this mission, everybody has to be a subject matter expert, because there is so much you have to learn. This is really an outside-the-box mission." Relying on a network of satellites and radar systems to detect and track potential ballistic missile launches, the job requires both technical and technological mastery, but also an analytical approach, said Brewer, adding that the mission training standards are high. "We're held to a 90% standard," he said. If [the teams] don't get 90% on their [training] then they fail and have to do it all over again. It's a no-fail mission." Brewer and many other brigade Soldiers take the no-fail creed to heart. "We can intercept missiles that are inbound to the United States, and it doesn't get any more important than that," he said, describing the mission as being "deployed in place." "When you're deployed, you're on that mission every day," said Brewer. "You're really thinking about that mission, you're studying that mission. When you're sitting at the console, it's the same thing." That mission also takes place around the clock. "We fight 24/7, 365 days a year," said Brewer. "If we get an alert that something is coming to the continental United States or Hawaii, we track it. We find out where the threat is, what the threat is doing and then we allocate ground-based interceptors [missiles] toward that threat." If needed, those missiles are then launched to defeat the threat, said Brewer. Based at Schriever Air Force Base, Colorado, the brigade has subordinate units at Vandenberg Air Force Base, California, and Fort Greely, Alaska -- all working together to track and, if needed, eliminate any incoming threats. The Alaska Army National Guard's 49th Missile Defense Battalion, based at Fort Greely, is the brigade element that Brewer described as being "at the tip of the spear." "They are the tactical fight, and we [the brigade] are the future fight," he said. "When you get a threat, you have that tactical side of we've got to knock it out of the sky. Then you have that future element: what if this happens? What if there are more launches? How are we going to negate these?" Negating those threats means both constant training, as well as ensuring radar systems and other equipment are up to date. "We've done multiple upgrades to our systems, both hardware and software," said Brewer. "It's upgrading everything from our eyes [radar] to how we actually intercept an incoming threat." A lot has changed since the brigade's 2003 activation. "Technology, the threat and threat models have changed," said Brewer. "Our techniques and tactics have grown as the threat has grown and changed." Growing and evolving is integral to staying ahead of the threat, said Brewer. "We have to expand with it," he said. "We try to get ahead of the game and I feel we do a phenomenal job." Some of that ability to get ahead of the game comes with longevity, said Brewer. Many brigade Soldiers have been with the unit for years, some since the brigade's inception. "We have people here now who were here in 2003 [when the brigade activated], so we keep that historical background," said Brewer, adding it also means greater continuity of operations. "Most of the people I serve with, I've served with for eight to 10 years," he said. That has allowed brigade members to build greater relationships with entities outside the unit, including U.S. Strategic Command and U.S. Northern Command, as well as partner nations where forward-based radar sites are located. "That's where the National Guard is more than just homeland [response] and warfight," said Brewer. "We've branched out to help create those partnerships globally." That all comes together to make the brigade, and the Guard as a whole, a formidable force, Brewer said. "I think a lot of Guard members bring a lot of worldly experience to what we do," he said. "I think the Guard brings that to the fight with everything we do." For Brewer, his work at the brigade has been rewarding, even though he'd rather not have to execute a missile launch. "I hope we never have to use it," he said, of the threat response. Still, he said he's glad to be serving where he is. "It's the best Army mission or the best mission I've ever been on in my life," he said. COLORADO SPRINGS, Colo. --- Two ground-based interceptors launched from Vandenberg Air Force Base, California, March 25, in an anti-ballistic missile test that made history. The two multistage, solid fuel boosters were each tipped with a state-of-the-art exo-atmospheric kill vehicle. They propelled from silos and punctured the earth's atmosphere at thousands of feet per second, bound for a violent collision in space with a sophisticated ICBM-like target launched from more than 5,000 miles away. The test, known as Flight Test Ground-based Interceptor 11, or simply FTG-11, concluded within minutes as the two GBIs successfully hit their marks, obliterating them high above earth. FTG-11 was the first-ever salvo test of the Ground-based Midcourse Defense system and at its core were National Guard Soldiers representing Alaska, California and Colorado. 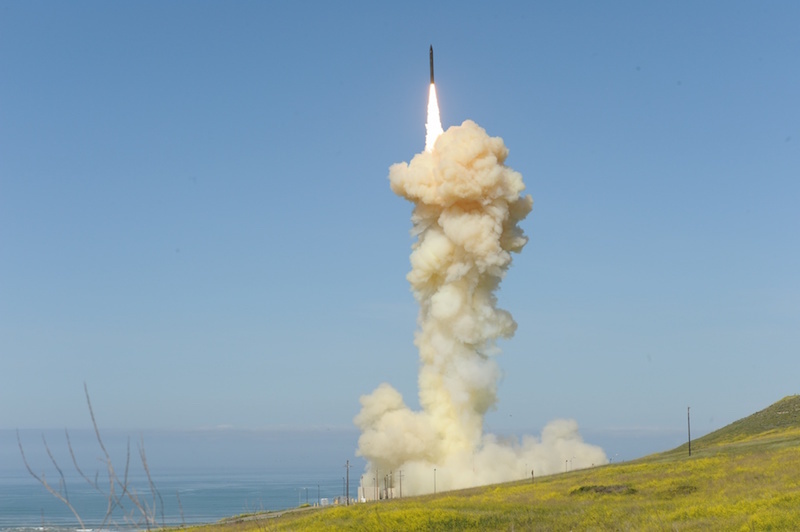 "This was the most significant flight test in the history of missile defense," said U.S. Army Lt. Col. Michael Strawbridge, 100th Missile Defense Brigade director of operations. "To compare it to something else in human history, I would liken it to space travel or putting a man on the moon. It was that complex." The test took less than an hour, but it was the culmination of years of work, planning, training and development. "We were high-fiving each other after we knew the intercept was a success," said U.S. Army Maj. Terri Homestead-Lopez, a Fire Direction Center crew director. "It was exciting to see the system work and see our training pay off." Homestead-Lopez's crew at the 49th Missile Defense Battalion at Fort Greely, Alaska, performed the tactical level of the engagement, while the 100th Missile Defense Brigade crew at the Missile Defense Element at Schriever Air Force Base in Colorado Springs provided operational overwatch. "We go through so much training it becomes second nature," said Homestead-Lopez. "When you actually see it in real life, it gives you another level of security and confidence." While Ground-based Midcourse Defense is the joint effort of many agencies, it is the Soldiers of the 100th Missile Defense Brigade and its subordinate command, the 49th Missile Defense Battalion, who operate the fire control system, dictate the tactics, techniques and procedures, fight the battle and ultimately defend the homeland from ICBM attack. Strawbridge said the test was as complex as it was realistic. The target was designed to simulate future threat models, complete with a reentry vehicle resembling an enemy warhead and decoys intended to confuse the sensors and system. "The stage was set by the last test in 2017," said Strawbridge of FTG-15. "Information from that test was used to design this one, but this one was two- to three-fold higher in the amount of complexity and difficulty." Also new to FTG-11 was the crew preparation. "In past tests, there have been designated test crews," said Strawbridge. "For this test, we ensured that all certified crews were ready, just like in normal day-to-day operations. We tested the way we would fight." Crews are notified that there will be a test launch, but they do not know details such as timing of launch and its aim point. They rely on an enterprise of sea-, land- and space-based sensors to determine how and when to engage a threat. By many accounts, FTG-11 was a triumph of human achievement and engineering. However, not all tests of the GMD system have been successful. Sgt. Hayden Murray, a readiness noncommissioned officer on a 100th Missile Defense Brigade MDE crew, said the test record is misconstrued because critics do not consider the spiral development the system has undergone since its inception. "It's not a fair comparison to look at tests from 10-15 years ago," said Murray. "The system performed flawlessly on this test and that's what we expected. We do so many intricate and complicated training runs, the test looked like anything else we've seen and we were ready to engage it." Homestead-Lopez said her excitement during FTG-11 was short lived, and her crew quickly resumed normal operations. She said she loves her job and talking about the mission of the Ground-based Midcourse Defense. "I don't know that the National Guard gets too many opportunities to perform a 24/7 real-world mission," said Homestead-Lopez. "That is exciting and humbling to know we are here, defending the homeland."